It started off like most camping trips: talk of gear and schedules, repeated trips to REI, and sugar plums dancing through our heads. We had 4 guys, gear, and a plan. 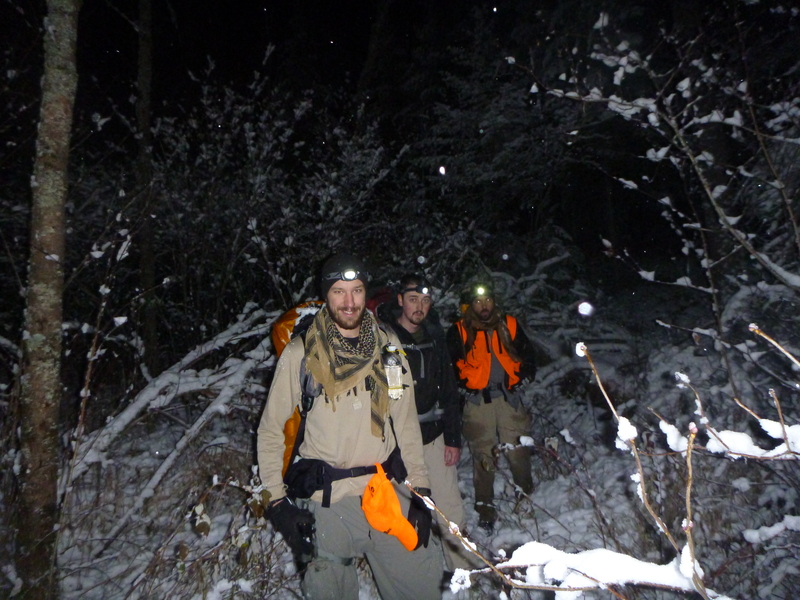 Originally, we had picked a section of the Superior Hiking Trail for this trip, but the deer hunting opener was the same weekend as our scheduled hike. Much of the facilities/parks along the trail were closed for The Opener, and advice seemed to steer us away. We couldn’t move the date up due to other commitments, and we didn’t want to push it any closer to winter, so the location had to change. Josh, had been following a fellow (shugemery) on the YouTubes a bit, and he had a few appealing videos on the Snowbank Lake Trail. A small discussion, a few clicks around the interwebs, and we were inspired. 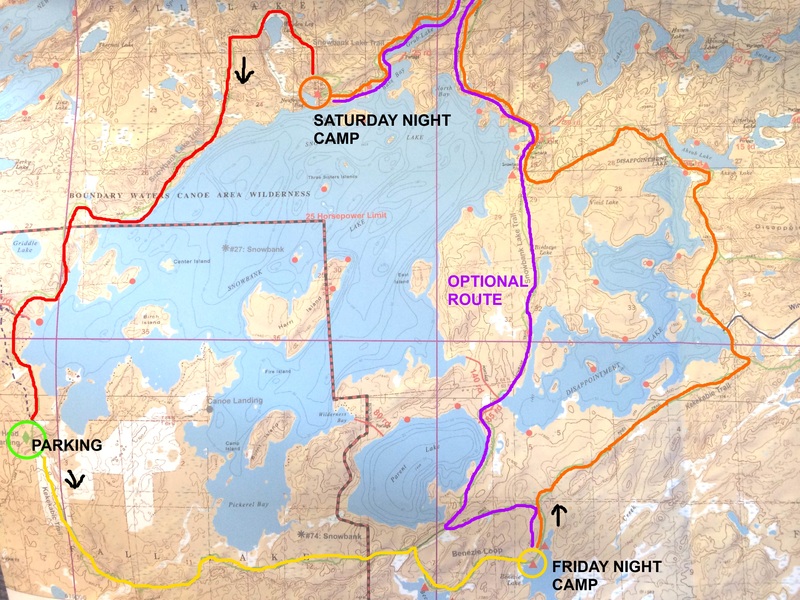 The plan was to leave The Twin Cities on Friday at 4:00pm, hit Ely at 8:00pm, grab some late dinner and then arrive at the trailhead about 10:00pm. From there we would hike the estimated 5-6 miles in about 3 hours, set up camp, and be asleep by 2:00am. Saturday, we would hike 10 to 12 miles, depending on the route, and then finish up on Sunday with another 8 to 10 miles. That sounded perfectly fun and delightful. Checking the weather early in the week, it looked like temperatures would cooperate and be pleasant for the weekend. On Thursday, the forecast shifted just slightly, adding a prediction of less than an inch of light snow and temps around freezing. If only that would have been true. Friday arrived and things were going as planned. 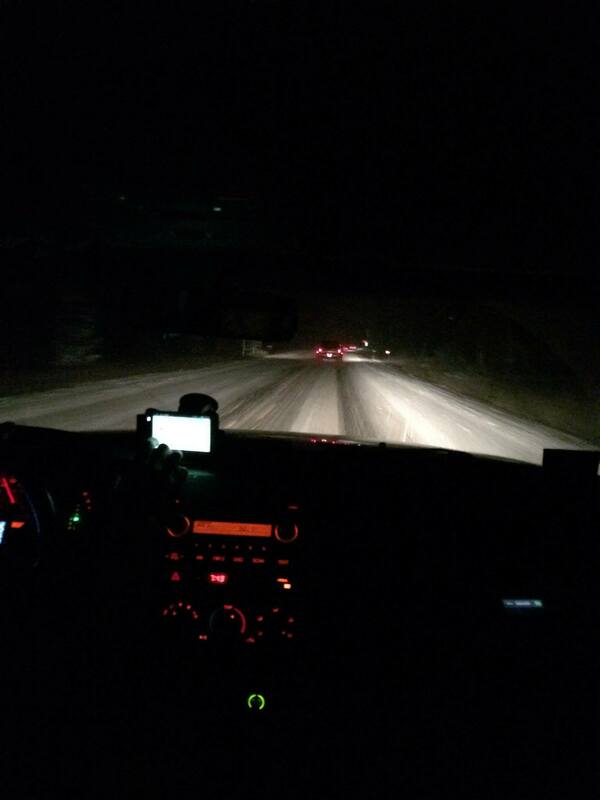 Josh, Torry, Cooper, and I departed; traffic was a non-issue, and as we neared Ely, flurries appeared in the headlights. Over an inch had accumulated by the time we pulled into the Ely DQ parking lot, and the first winter snowfall was in full swing for the last leg to the trailhead. Thick, wet snow-covered the road and provided a couple of exciting moments as we finished our drive (note to self: truck beds need weight for traction). 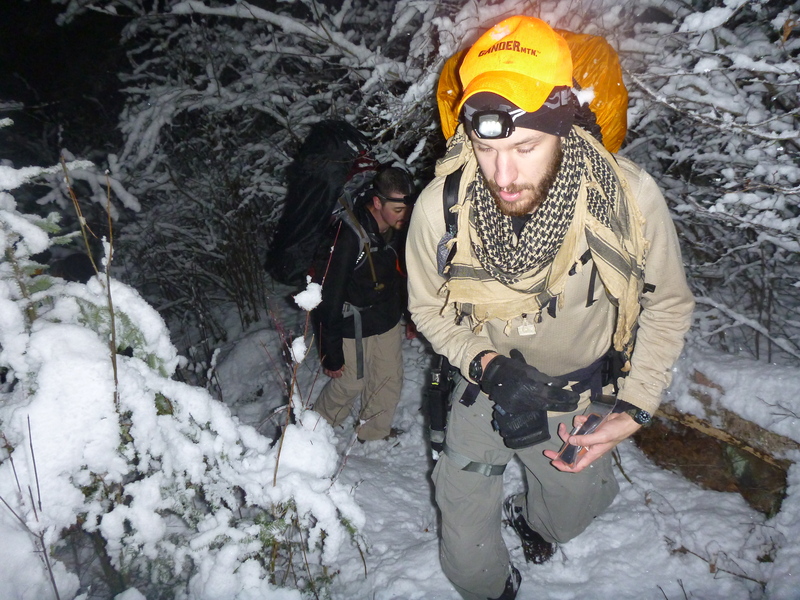 Once at the trailhead, we suited up and headed out fairly quickly. The temperature was probably in the lower thirties which made the three-ish inches of snow cling to everything. We set out with high spirits and dry feet, and started covering ground (except for when Josh had to go back to the truck). The fresh snow didn’t mask the trail too heavily, and it felt like we were moving pretty quickly. A couple of hours in, previous warnings would prove themselves relevant. The trail would occasionally disappear from beneath our feet. Due to the cloud cover and precipitation, we were in pitch darkness. 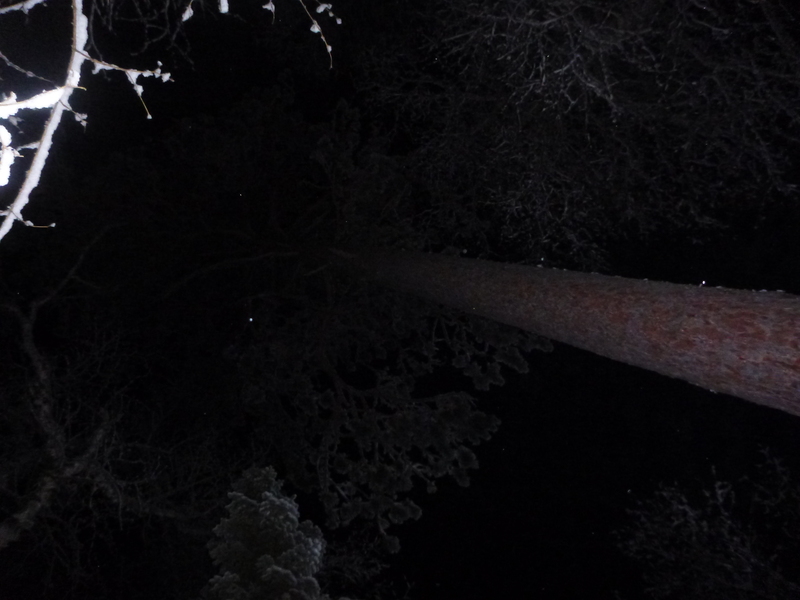 We could only see the distance our headlamps would illuminate, 20 to 30 feet if we were lucky. We were mostly just navigating by faith: following the trail, believing that it would lead us to our campsite. We used a McKenzie Map (number 9) of the area and a compass for general navigation, and a pre-downloaded map of the area (iPhone) for rough GPS assistance. There were a couple of situations in which we found ourselves really scratching our heads. The trail not-so-clearly crossed over beaver dams that appear to have been added after the map was printed. (It’s a feature!) In one instance, the trail actually lead straight into the pond created by one of the dams. We burned at least an hour “navigating”, waffling, discussing, and backtracking throughout the night. Wet snow, sleet, rain, and creek crossings took its toll on us. Once we hit 1am (when we thought we would be in camp) we started to question where the hell we were. According to the GPS, we were only HALF WAY! We were heads down without conversation, trying to cover ground. Morale was low. After a failed attempt at a shortcut, Josh said what we were all thinking. We decided that our goal would change from hiking all the way around Snowbank Lake, to just getting to the campsite and re-evaluating. Instead of a loop hike, perhaps an in-and-out hike was in order. Spirits immediately rose. Despite being wet all over, things seemed better. All smiles… we can change that. We reached the area where we knew our campsite was, but as it was back off the trail a ways, we couldn’t find it. In the daylight we would find that there was a signpost and a trail leading directly there, but we missed it in the darkness. We settled to just to bushwhack until we came across it. Within a couple of minutes I stumbled across the latrine. From there, the rest of the site was easy to find. With wetted out pants and cold feet, we arrived at our campsite at about 4am. Two of us were pretty cold, so we set out to make a fire. As everything was soaked, getting a fire going wasn’t easy. We managed a small fire while the two least-wet hikers set up the tents. We settled in for the night, hoping dryer clothes, tents, and sleeping bags would bring warmth and sleep. The day was a lesson in patience, persistence, and adaptability. The group was tired and uncomfortable, but we never broke down. 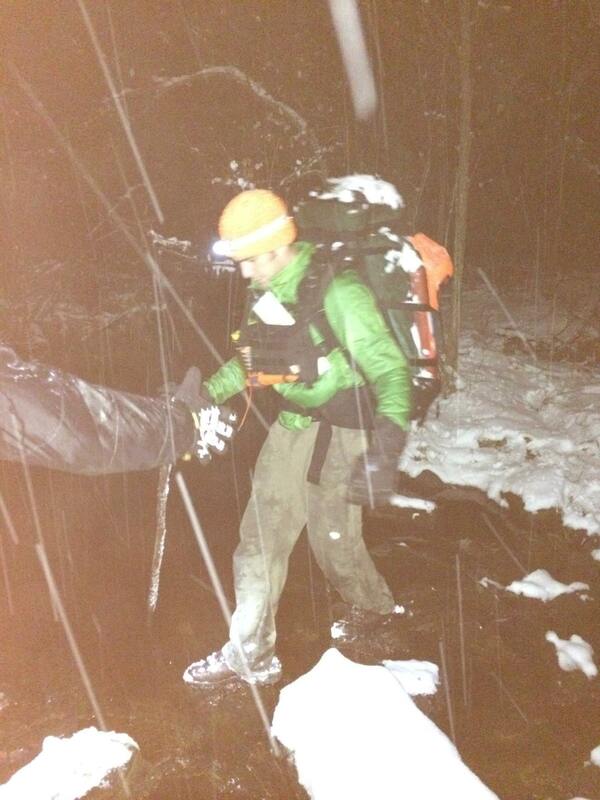 Hiking through this terrain in a wintry mix at night was challenging and awesome. It adds a completely different perspective, both alluring and ominous. Move along to Part 2.